The days that followed the plane crash will always be a blur. I remember being humbled to a very meager existence. I didn't eat, sleep or talk much. I recall wondering if I should shower. It is really weird what your mind requires when you are in shock. Not much. Just breathing, mostly. The Sunday after the crash Lucy and I made immediate plans to get down to the children. I told Chup to buy us open-ended tickets. We knew that they were in the best hands with Christian's wonderful family, but we wanted to be useful. We wanted Steph to know that we would respond drastically if needed. We felt like we would stay for months if that is what it took. At that point everything was so unsure and scary. I wasn't weepy, just extremely anxious. That night our doorbell rang. I ran downstairs suddenly aware of my shower-less state and sense of disheveled-ness. Chup responded and came down to The Dungeon where I had started some laundry for my stay in Mesa. "It's Mindy Gledhill." Chup announced. Though I had never met Mindy, she had been Stephanie's high school friend and favorite singer/song writer (along with Alison Kraus) for years. The very reason for our last phone call--a week prior to the crash--was about Mindy Gledhill. Steph really wanted to get her to Mesa for a concert in the fall. She asked me to send her Scott Wiley's Baby Mine cd with Mindy singing Golden Slumbers. She needed for PR for the concert and because I am a lazy responder, I called Steph to say sorry for my delay. Also, as you might recall, I had some hot gossip to share. At that point, as I filled the washer with detergent in my scroungy pajamas, I felt like seeing Mindy was completely comforting. She was a recent connection from me to my sister. So upstairs I went. Mindy is beautiful. She's quiet when she talks and very sincere. She gave me a card to read to Steph bedside. I told her about how our last conversation included her and how seeing her at my doorstep was a sweet experience for me. She offered to come back with the lullaby cd and some more of her music to play in the hospital room. And for the first time since hearing of my sister's grave condition I cried. The first time I saw Stephanie and Christian in the hospital I knew that I should take the children home with me. I called Chup and told him to made the eight hour drive down and pick us up. By Thursday the family car was packed with books, toys and clothing (some now RIP on the side of the road). Our brother Andrew and Chup traded off driving us through the desert. Heaven knows none of us will ever forget that journey. And as we counted off the miles we listened to the lullaby cd. The children requested hearing it over and over again. Mindy sang us home. Shortly after all of this occurred Mindy did a very brave thing. She made the decision to continue with the concert, this time dedicating all the profits to the Nie Recovery fund. Of course, this effort takes dozens of volunteers and management. She conjured up all sorts of help and kept me updated with simple e-mails. My Overpaid Blog Designer Jed Wells did the beautiful concert poster (also the mastermind behind this poster). Christian's sister and cousin offered to help in Mesa. This contribution was the first of all the Nie Recovery efforts. I was astounded. And then, a couple weeks ago, Mindy had a simple request. Could Claire and Jane join her on stage to sing Golden Slumbers? The song that had nursed us to better times in these past few months. An anthem of ours. We asked the girls if they would sing for Mindy. For a big audience. For their mom. And they were explosively excited. (We've been practicing every day since with pretend microphones.) A couple days ago we met with Mindy for our first official run through. This concert promises to be the ultimate tribute to my sister. Joining Mindy, Claire, and Jane on stage will by my very own Chup, who will make a cameo as the emcee. Concert goers will be able to buy Nie-inspired treats and snacks as well as the now-famous Nie Nie t-shirts! I think I can also promise that this won't be the last of the surprises that we can announce about this concert. Please stay tuned . . . The concert will be next Saturday, October 25th at Mountain View High School in Mesa. 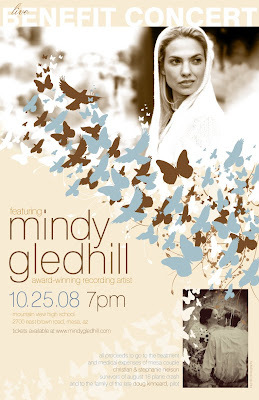 Tickets are available online at MindyGledhill.com (see: Events) or at Pioneer Books in Mesa. Also, tickets will be available at the door, only if we don't sell out first! Steph wrote about Mindy on her Friday Face segment here. Mindy's blog post about putting together this event is read here. One more thing, if you live in Arizona, have a blog and would like to help us with the concert promotion will you post about the concert on your own blog? You can grab the amazingly designed concert poster here.